You were friendly, prompt, and accessible. I would work with you again. Overall excellent but like I said in the above, my disappointment was with having only basic cable and not hearing that fact on website or in conversation with your team. Sorry we didn't let you know. Each of our properties are individually owned and level of cable is widely variable. Hope we can d a better job for you in the future. From the on-line experience to the one-on-one interactions, every person I dealt with was professional and friendly. I also have to say that the systems that support the rental, e.g. The way the lock works, the notes and guides were also professional and user-friendly. We rented Arch Cape for a week and shared the space with family, including a 3 year old grandson! Because more family and friends were situated nearby, Cape Hideaway was a centre for extended family dinners and beach fun. Everything about Cape Hideaway worked beautifully for our special week -- but we definitely needed more wine glasses! I enjoyed their very personable attitudes. I would love to be considered part of your team should you ever need a new part of the crew. As I mentioned I'm considering move to Oregon and I think working in this industry would be very satisfying and enjoyable. Can't beat the view! This small house has everything you would hope for in an ocean cabin. Surprisingly, being located right on the main street through town, peacefully quiet. 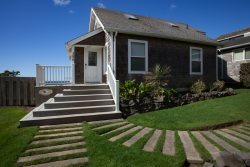 Not a large property, not the newest and most chic property but one that really gives you the "beachy" cottage right out of the 1950's and it even has a flat screen and Wi-Fi should you need to look up the best places to dine or directions. Kudos on making us feel welcome from the moment we stepped in the front door with the complimentary refrigerator bag filled with coupons, coffee mugs and fresh coffee beans. Excellent service on short notice on a busy holiday weekend. Beautifully maintained and clean. It was such a surprise to receive a gift bag with my favoritec coffee - Sleeping Monk- from Cannon Beach. Thank you for that. Super friendly ladies in the office, which I appreciated. Much friendlier than most other places I have checked-in. My family thoroughly enjoyed our stay at Robars and would go back again. Its a great place to experience and explore Cannon Beach. They were awesome every time we interacted. Great staff. We had been there five minutes when my brother asked if we could PLEASE book this house again next year. Everyone else agreed. Sophie's Place is the best house we've ever rented at the beach. Close to everything, huge, great amenities, great for multiple families. The team were very friendly and helpful and kept us informed about the problems with our original rental house and provided a great alternative. They also rang to inform us of the changes to local regulations regarding bonfires due to the drought conditions prevailing at the time. We had a very pleasant and comfortable stay and will hopefully return in the near future to stay in this lovely seaside community. Love the place, it just needs some minor refurbishing to bring it back up to a 4.5 star rating. We are happy to report the furnishings are being updated this winter and the house has a fresh coat of paint. Thank you for staying with us and Pearl we hope that you will enjoy the improvements at your next stay. overall very nice - just the minor things mentioned above. Everyone that I spoke with was friendly and helpful. Elliot Bay Cottage was the most well-stocked vacation rental I have ever been in! I would recommend this rental to anyone with young children.